The weather people were predicting twelve to fourteen inches of snow, but here Sunday started with above freezing temperatures and a hard steady rain. By afternoon it was still raining but the temperature was steadily dropping and by the time it was dark the rain had changed to freezing rain and sleet. We started hearing branches snap and the thuds as they fell. There was thunder and lightning and power surges that kept the telephone ringing periodically with odd partial rings. Just after midnight the electricity went off, came back on and went off again a few times, and then stayed off. It definitely was not a night for sleeping. By Monday morning the sleet and freezing rain had stopped and a heavy, heavy snowfall had begun. 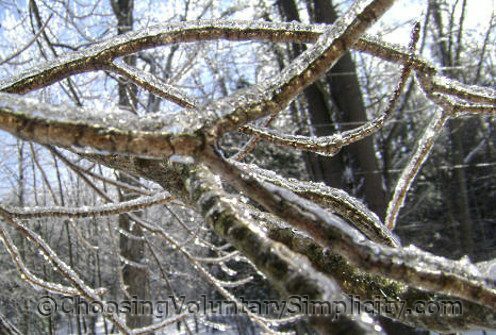 We could see many branches from our beautiful pine trees bent almost to the ground from the weight of the ice and snow. A few branches had already broken and were lying on the ground. The recorded message from the electric company said that there were already repair crews in the area. Their early estimate was that our power would be back on within a few hours, but as the snow kept falling and the winds picked up again the time estimates kept being pushed back. When we were still without power after six last night, we called again to get the latest update and heard the discouraging news that we should not expect to have our power back on until possibly eight p.m. on Tuesday or more probably not until eight p.m. the day after that. And then, while we were trying to plan the best use of our generator to keep our frozen foods frozen and our refrigerated foods refrigerated for an additional two days… the electricity suddenly came back on. We were very, very fortunate because most people in the towns surrounding ours are still without power today. Many areas won’t get their power back until the end of the week because the temperature is staying right at the freezing mark and a heavy coating of ice remains on the trees, the power lines, the roads, cars… everything. And we still have the eight-foot-plus high snow banks on each side of the road and snow at least four feet deep everywhere else. On the plus side… the sky today is a bright deep blue, the sun is shining, and the trees sparkle like crystal. It’s a mess out there… but beautiful too! It’s amazing that something so destructive can end up being so beautiful. Your photos are breathtaking. 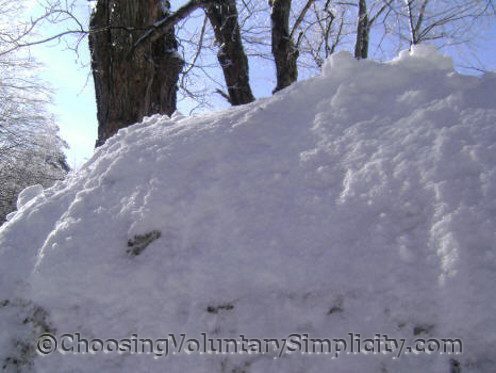 I live in Arizona and can only imagine what it must be like having 8-foot snowbanks and 4 feet of snow! Thanks for a wonderful blog. Yayy for you! I hope the ice melts soon and life gets back to normal. 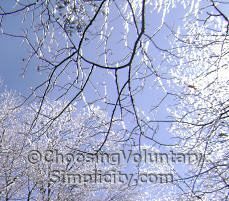 I don’t blame you for wanting spring but your right, the icy trees do look like crystle and yes it is beautiful. I have to say that I admire the way you approach life. Even when bad things happen you seem able to find the bright spots. I am trying to be more like you. I just wanted you to know that you and this blog have been a great inspiration to me. Thank you for being there. Some of my favorite times are just after a bad storm. The destruction is terrible but the beauty in its aftermath takes my breath away! 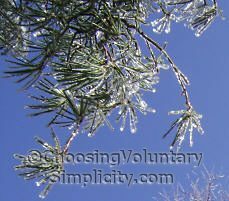 When the sun shines through branches of pine covered in ice I get out my camera, too. I have a three-sided prism that I look through. Everything is rainbows! Guess I’m still a kid after all these years. Pretty soon the bulbs will be pushing through the last of the snow and the earth will smell of newness. God gives us so much beauty.